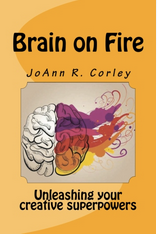 I am so excited to finally be able to announce the release of my latest book, Brain on Fire - Unleashing Your Creative Superpowers. I have for many years conducted creative, innovative and critical thinking workshops and finally have a book that complements the content. It's additionally exciting that the SHRMstore will be carrying it and I'll be doing a book signing after the mega-session: Creative & Innovative Thinking - The Next New Skill - SHRM15 - Las Vegas. Here is a link to purchase it. And if you're considering this topic for an employee training or conference keynote or breakout. Click here to learn about the presentation/ workshop.